It has become increasingly rare for a product reviewer to sit down with a product and have their expectations completely blown out of the water, and that's exactly what happened when I first pulled the throttle trigger for the Seismic MT. From the get-go, I was pretty excited to try out the Inductrix Switch All-in-One Drone/Hovercraft; however, my enthusiasm dampened somewhat during setup. First, in order to prepare the device for helicopter mode, you have to detach it from the base, a task that requires quite a bit of care because the plastic feels a little fragile. Plus, the instructions weren’t very intuitive, so it took some time to figure out how to put it in the different modes and turn it on (tip: to turn the fans on and off, press directly down onto the left toggle). Once you’ve deciphered the instructions, though, the controls are easy to get the hang of, and before we knew it, we had the Inductrix Switch zipping through the rooms of our house and terrorizing our cat. The Inductrix Switch responds to the slightest nudge of the controls, and since we sent it careening into walls and countertops more than once as we got a feel for how to steer it, it’s safe to assume that the Inductrix Switch might be more durable than it first appears. Also, I do not recommend sticking a finger into the actively spinning blades, as the plastic is quite a bit harder than it looks. The device turns on a dime in Hovercraft mode, and though it is slower on carpet than it is on hard floors, it still drives quite well. The main issue I had with the Inductrix Switch was the battery life. The battery runs out very quickly, so even though it’s extremely fun to play with, the fun just doesn’t last long enough. However, the the battery will reach full charge fairly quickly once you plug it in. Mugen Seiki Racing is happy to announce the new MBX8T Nitro and MBX8TE Electric trucks. The MBX8T and MBX8T Eco kits include many high-end improvements in durability, acceleration, suspension, steering, and traction to create the ultimate 1/8th nitro and electric off-road truck kits. -The MBX8T chassis features a new design. The new chassis improves steering and is more consistent in bumpy conditions. -High Traction Differentials are included in the MBX8T. The Mugen Seiki HTD provides increased acceleration, longer runtime, and more consistent handling. The HTD's also increase stability, traction and improve handling in bumpy conditions. The HTD has a new larger volume diff cup to increase consistency during long main events. This makes it easier to time rhythm sections, better in bumpy and low grip conditions, helps to increase traction, and increases fuel mileage. - New straight cut 10T bevel gear and 46T conical gear. The new straight cut bevel and conical gears increase acceleration, runtime, and efficiency. A free and efficient drivetrain will also increase speeds while cornering. -New front and rear gearbox. The new gearbox allows you to remove and service the differentials without detaching the suspension arm mounts. -New suspension mounts. The FF/FR/RF/RR are new for the MBX8T. -New box-shaped suspension arms and arm stiffeners. The front and rear lower arms use a new impact resistant material for increased durability. The new arms are box-shaped and include arm stiffeners to reduce flex and increase durability. Adjusting the hardness of the lower suspension arms is now possible. This allows you to fine tune the steering and traction from track to track. CFRP plates will be released as an option part. The MBX8T uses longer suspension arms to increase traction and stability. -The center differential mounts use a stiffer material and has a new top plate to reduce chassis flex and increases clutch bell, spur gear, and clutch bearing life. The reduced chassis flex also provides more consistent handling in all conditions. The top plate design also makes it easier to adjust the brakes and easier maintenance. -The new lightweight one-piece wing mount lower the center of gravity. The position of the wing and wing mount is optimized to improve the performance of vehicle. The height of the wing mount is adjustable. This allows you to control the down force on the rear of the vehicle by simply raising or lowering the mount on the shock tower. The new IFMAR legal wing is lightweight and provides amazing down force and corning. The underside of the wing uses a new design to reduced weight and creates additional down-force. -The MBX8T still uses a flat 2S lipo or Life battery, but the receiver battery is now enclosed in a molded battery box. The battery box allows for quick and easy access to the battery. The molded box also helps protect the battery from hard impacts. The battery box is mounted to an updated carbon fiber radio plate. - 3mm A7075 hard anodized chassis. - HT Differentials throughout and lightweight 47T spur gear. - Straight cut conical and ring differential gears. - Durable box-shaped suspension arms and arm stiffeners. - Front/Rear 16mm hard anodized threaded shocks with 3.5mm shock shafts. Every now and again, as with any industry, you come across some products that frankly make little sense when placed side by side. This is just such an occurrence. 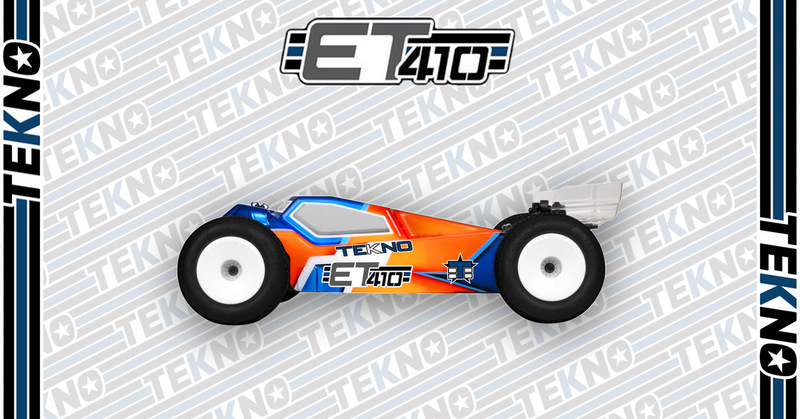 New ET410 1/10th 4WD Competition Electric Truggy Kit From Tekno RC! Tekno RC is proud to announce the newest addition to our stable of innovative RC vehicles – ET410 1/10th 4WD Competition Electric Truggy Kit!